Continuing the current wave of Stephen King adaptations to hit the big screen, I'm happy to report that 1922, based on a novella of the same name, is a pretty great piece of gothic horror. 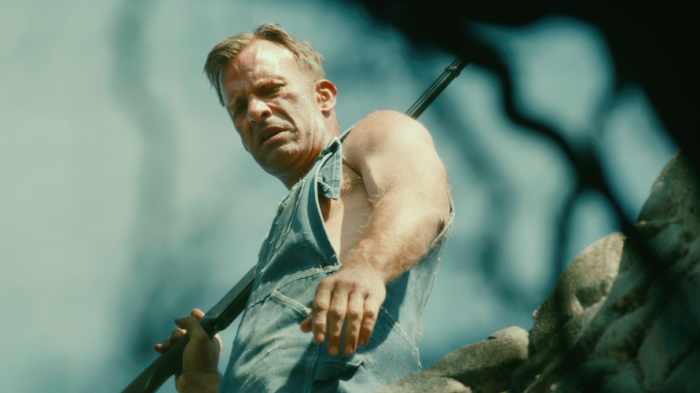 Set on a farm in Nebraska in, you guessed it, 1922, the film follows Wilfred "Wilf" James (an excellent Thomas Jane) and it begins by Wilf confessing to the murder of his wife via a letter he's writing in a hotel room. The how and the why he murders his wife are important, but more important is how the act weighs on Wilf and how it affects his son, who along with his home and his land, is all he has left. Guilt plays an important role in the film, and as viewers we're never quite sure if the horrors Wilf experiences are real or if he's slowly losing his sanity. There's more than a little Poe, Lovecraft, and even Hawthorne in 1922. In one scene Wilf is even reading Hawthorne's House of Seven Gables, which is certainly no coincidence. Thomas Jane is mostly a one-man show. Sure, there is a supporting cast, and they all perform admirably, but Jane has to carry most of the film by himself, and this is probably the best work he's done since The Mist, another solid King adaptation. While I'm still not entirely sold on his 1920's Nebraskan accent, I can't deny that it mostly works, though it does come off a little too much like Brad Pitt's Aldo Raine from Inglorious Basterds. Don't go into 1922 looking for jump scares or much in the way of action. This is a slow burn all the way, with the focus being on Jane's fall from grace (and possibly sanity). When there's violence, it's extreme and gory, but it's used sparingly, and to good effect. There's a mounting sense of dread that builds as the film comes to a conclusion, and while it's a serviceable ending, I can't help but feel like it was maybe a missed opportunity to end the movie on a high note (figuratively speaking).